Very interesting, but I think someone should point out that claiming this is a remake of Dark Force's first level is totally innacurate (not Shawn Knight's fault since everyone around the web is claiming that's what it is). 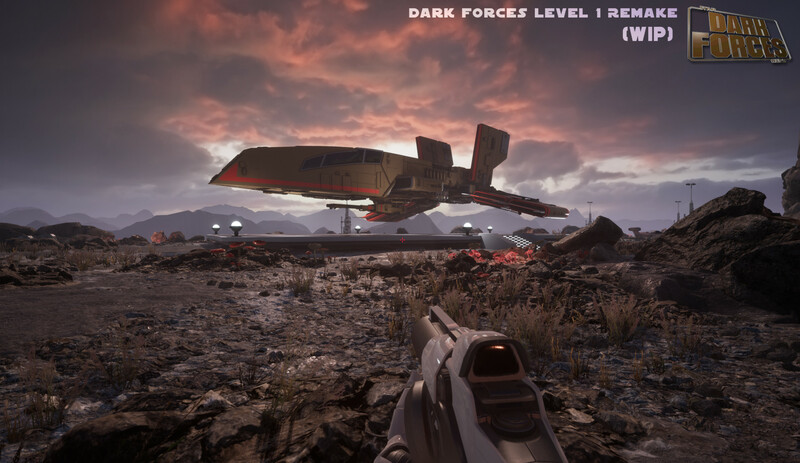 In the original game the first level is set in an Imperial outpost in some dark unhospitable planet (with a landscape similar to LV-426 from Aliens), and not only that, but if my memory is correct we don't ever visit Mos Esley on the first Dark Forces. If that's supposed to be the first level you could call it a modern retelling / reinterpretation of the original game of course (like Doom 2016), but not a remake. Julio Franco and Polycount like this. If you stick to the established models presented in the Star Wars trilogy, you can easily build a great looking Star Wars game, give in Star Wars music and have a grand product that does nothing new or edgy. Yep, this is the best way to get around those restrictions. OMG, I loved Dark Forces. WHy the hell have there been no single player Star Wars games for so long. I'd love to see a full blown remake with UE4 and ray-tracing. I remember the original game. It was very cool. Awesome. Brings back memories of 1990s gaming on my 486/DX 33. Reminds me of last year's fan mod of the demo of the canceled Silent Hills PT game called UNREAL PT by RadiusGordello.